This picture was the first masterpiece of Edvard Munch, exhibited in 1886, but at first she did not receive recognition. Critics and spectators blamed Munch for his dishonest attitude to work, as well as incompleteness and rudeness of the composition. In their essays, writers printed a lot of negative and even angry reviews from viewers of the exhibition. Only half a century later, the picture was accepted by people and became part of the artistic world. Munch was very inspiring, but at the same time inspired by the theme of death. Personal pain after the loss of his older sister Sophie, who had died from tuberculosis, was the impetus for him in creating the “Sick Girl” canvas. The image makes the viewer feel like touching and sentimental feelings. The characters in the picture are a woman of advanced years and a girl who looks sick. A woman, perhaps offering up desperate prayers to heaven, holds the frail child by the hand. Bright red hair, reclining on the girl’s pillow, emphasizes the unhealthy color of her skin. From it comes a light glow, personifying her imminent departure into another world. Although the canvas has bright colors that enliven its appearance, in general, the work of Munch makes quite heavy impressions. A lot of dark colors leads to tragic thoughts about imminent and impending death. Despite the gloom of the room and the overall situation, the sick girl’s eyes do not express pain or fear. Her gaze is full of humility and tranquility, perhaps she does not understand what should happen to her. It makes the beholder empathize with the suffering of the unfortunate patient. 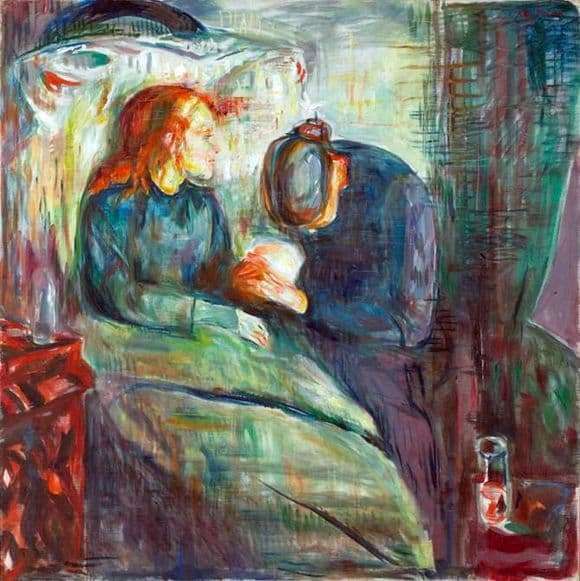 Appearance of the patient in this picture Munch wrote with this girl, he saw by chance. She was only 11 years old, but he was deeply struck by a feeling of kindness and compassion for his sick brother, which was so capable of being so young.